The bosses of Netflix disappointed investors by announcing they expected to sign up only 2m international subscribers to the video-streaming service in the current quarter. That compares with 4.5m in the first quarter and about 2.4m in the second quarter of 2015. They blamed a challenging comparative period that saw the roll out of the service in Australia and New Zealand. The news came hours after Amazon revealed it would, for the first time, offer a separate subscription to its rival service, Amazon Instant Video. It was previously bundled with its Amazon Prime two-day shipping service. The e-commerce titan may be looking to sap Netflix's momentum: it recently launched in 100 new markets and has earmarked $5bn (£3.5bn) to spend on content in 2016. However, Slate highlights survey data showing 62 per cent of Amazon Instant Video users subscribe to Netflix, suggesting the two are complementary rather than substitutes. 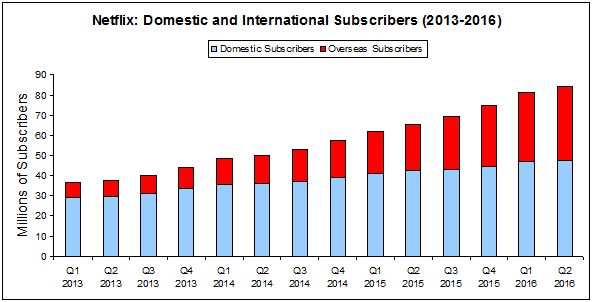 Our chart shows the rapid growth in Netflix's overseas subscribers in the past three years, but suggests it could be tailing off despite the company's aggressive expansion.